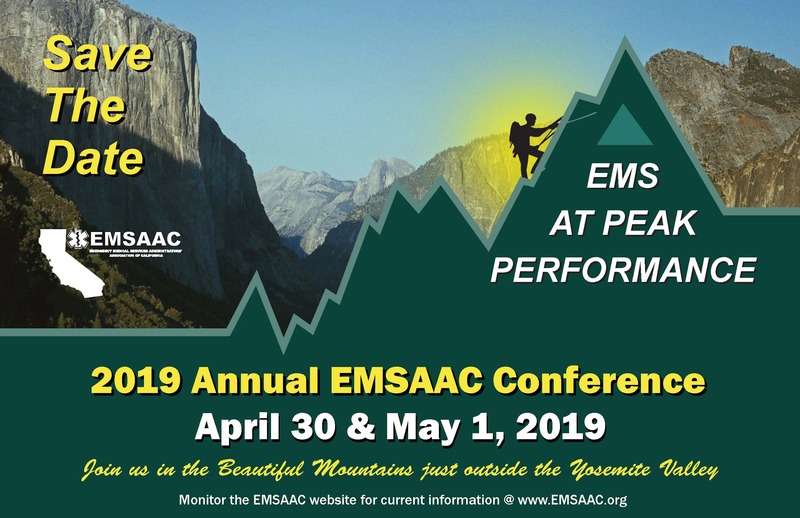 Mark your calendar now for EMSAAC's exciting 2019 Conference on April 30 - May 1, 2019 at Tenaya Lodge, a full-service resort in a beautiful alpine setting near Yosemite National Park. Mail-in registration form attached below. Discount Code: 31B04C If you plan to enjoy the area and extend your stay beyond the dates of the conference, you must make your reservation by calling the reservation line below and mention the group name or code, as you cannot book extended stays online. Guests unable to use Tenaya's online reservation system can make a reservation by calling (800) 635-5807, option #1 and identify they are with the Emergency Medical Services Administrators' Association, or using the group code to receive the group rate. -- Reservations can be booked online using a mobile device. -- If booking online, and you are prompted that reservations are sold out, please call the reservation line above for assistance. -- For guests arriving prior to or staying after the dates, rates will be offered based on availability and will be subject to current room rates and reservation restrictions at the time the reservation is requested.